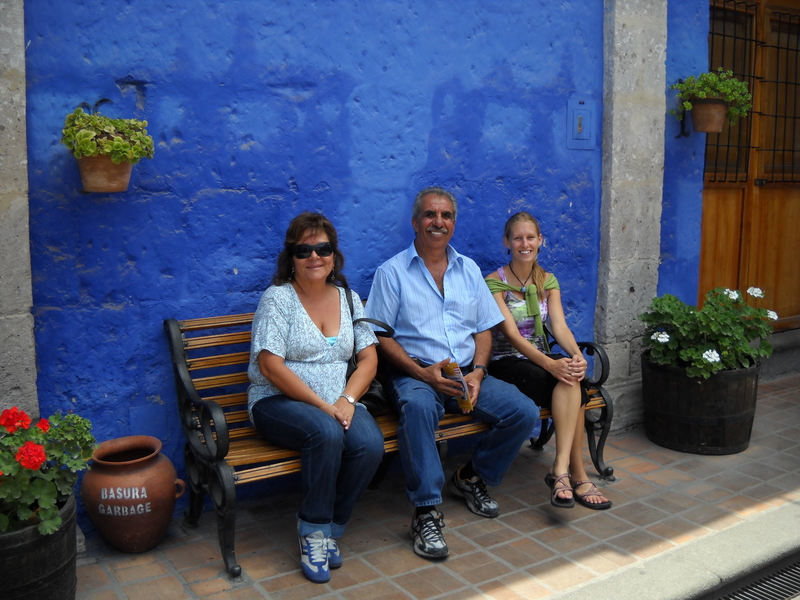 2) Our wonderful hosts; Alberto (who works with Charlie) and Rosa. 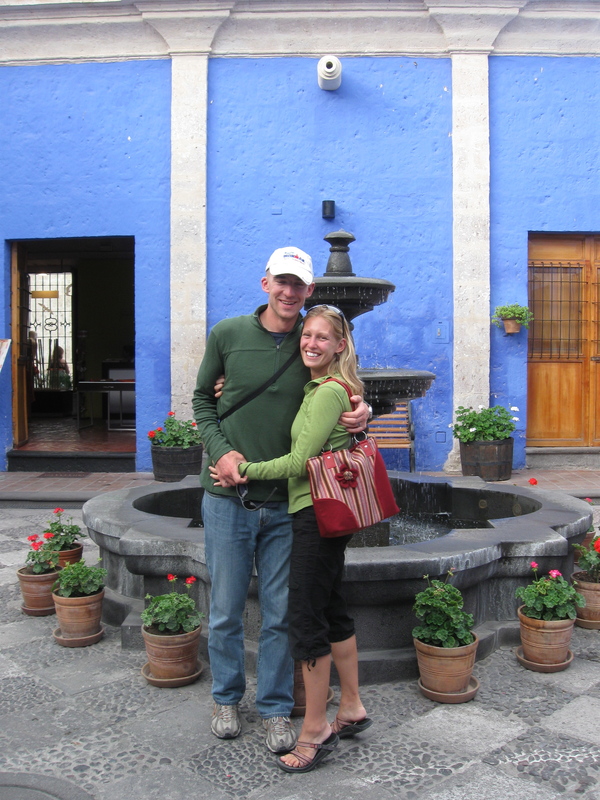 Along with letting us stay in their house, they showed us around our first day in Arequipa and Rosa prepared breakfast for us every morning! 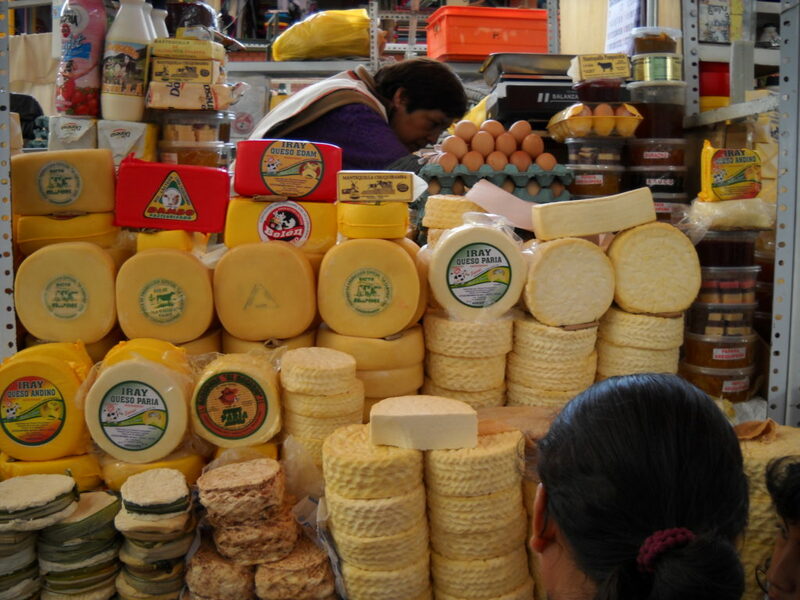 3) Yummy Arequipena cheese in the market. 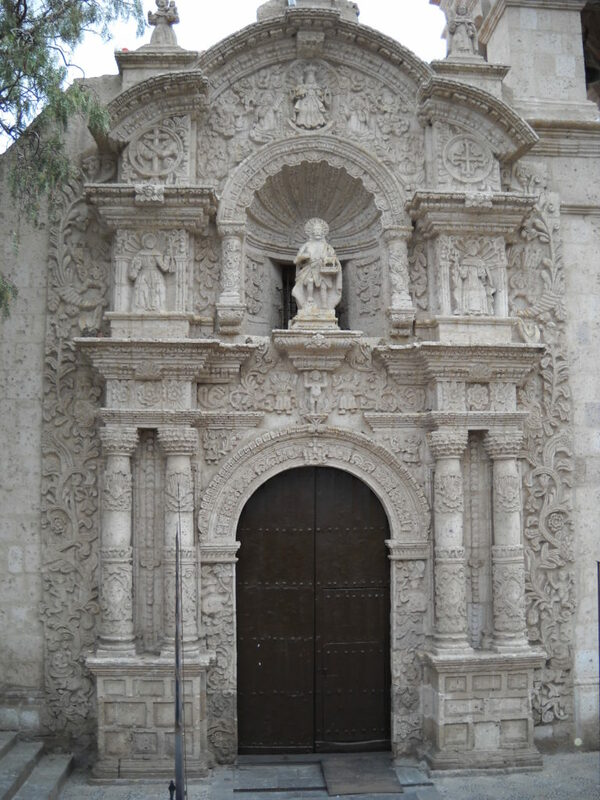 4) The city is filled with colonial-era Spanish style churches made from sillar. 4) We visited El Monasterio Santa Catalena. A photographer’s dream, it is enormous and often described as a city within a city. Founded in 1580, it originally only accepted nuns who came from rich families who could pay a significant dowry. Although it was traditional for rich, upper class Spanish families to send their second child to serve God in chaste poverty, in this case the nuns each had between one and four slaves and had frequent parties inviting musicians from town. They lived it up in the style to which they were accustomed. After 1871, the Pope got word of this and sent a strict nun to whip things into shape. She fired the slaves (although some stayed on and became nuns), and sent the dowries back to their families. From this point on, the nuns were not allowed to venture outside the walls of the monastery. Currently around 30 nuns still live in a newer section where they have no interaction with society outside of the monastery. To their credit, it didn’t seem all that bad there. There were lots of beautiful courtyards and the nun’s chambers were spacious and comfortable. 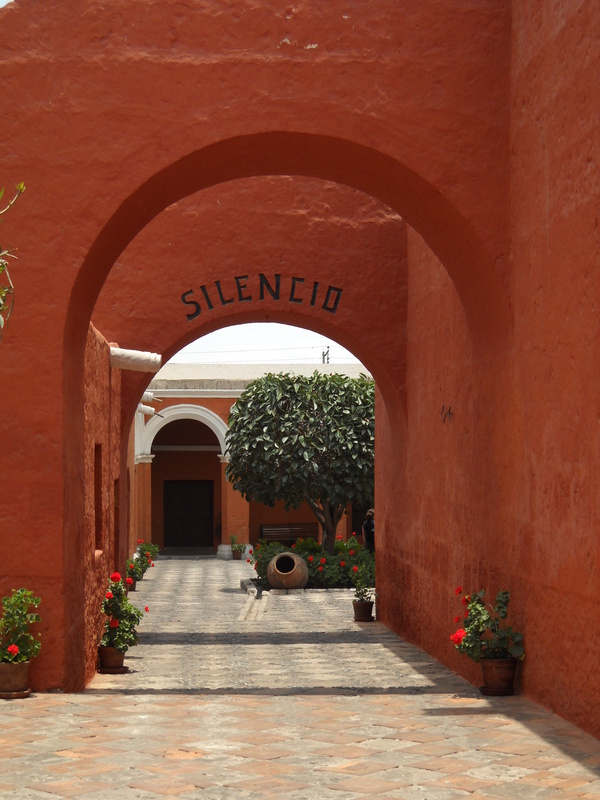 Each nun had their own “cell” with a bed, a praying area, and its own kitchen. 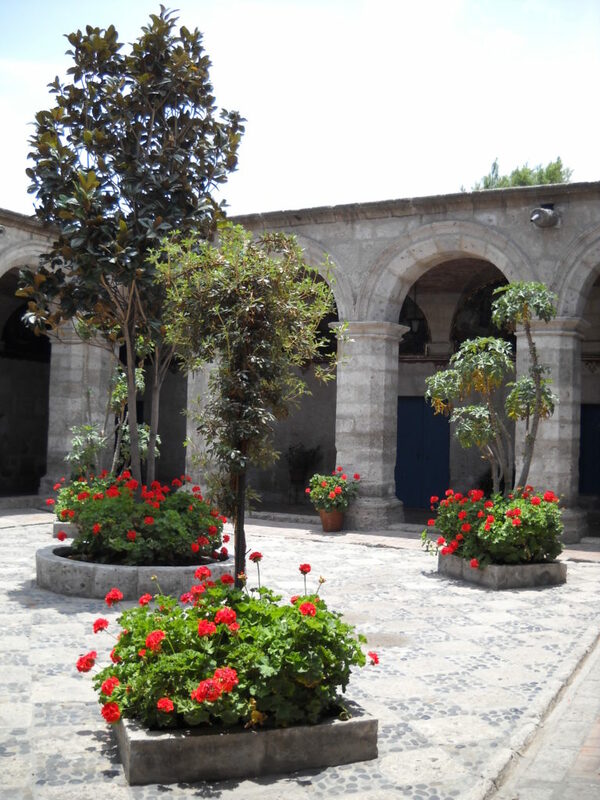 5) The place is filled with beautiful courtyards and brightly colored flowers. 6) Praying in one of the nuns cells. 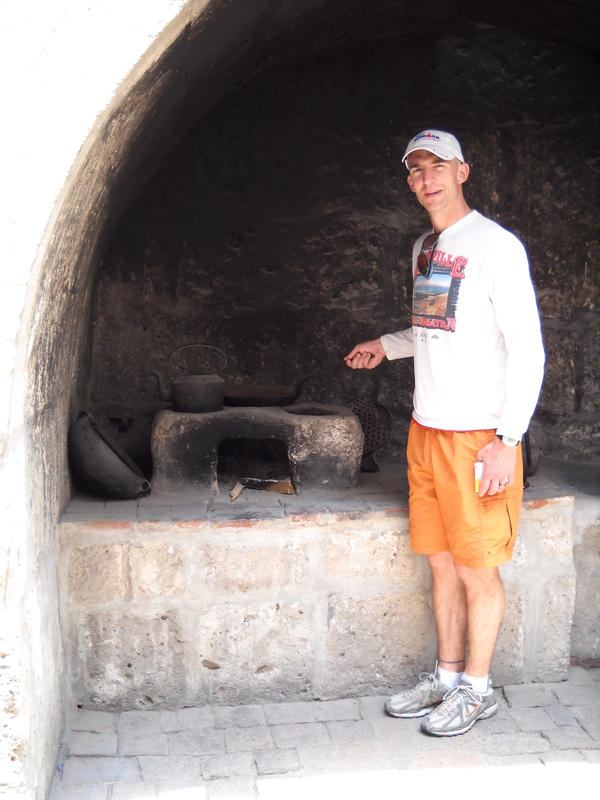 7) Charlie cooking in one of the nun’s kitchens. To his credit, I begged him to pose for this picture. He would not have done it voluntarily. 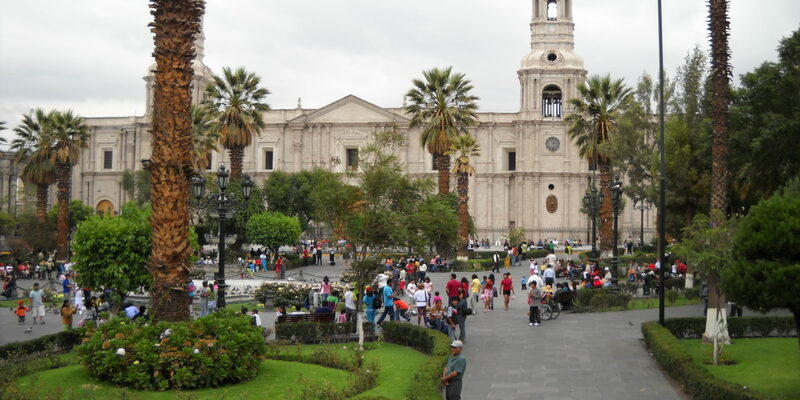 8) We were in Arequipa during Carnival time. 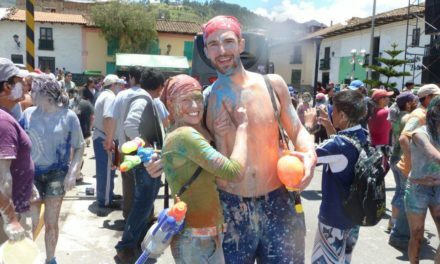 As far as I can tell, they celebrate Carnival in Arequipa by throwing water balloons and spraying each other with foam. We got nailed by several water balloons and I was not happy about this. 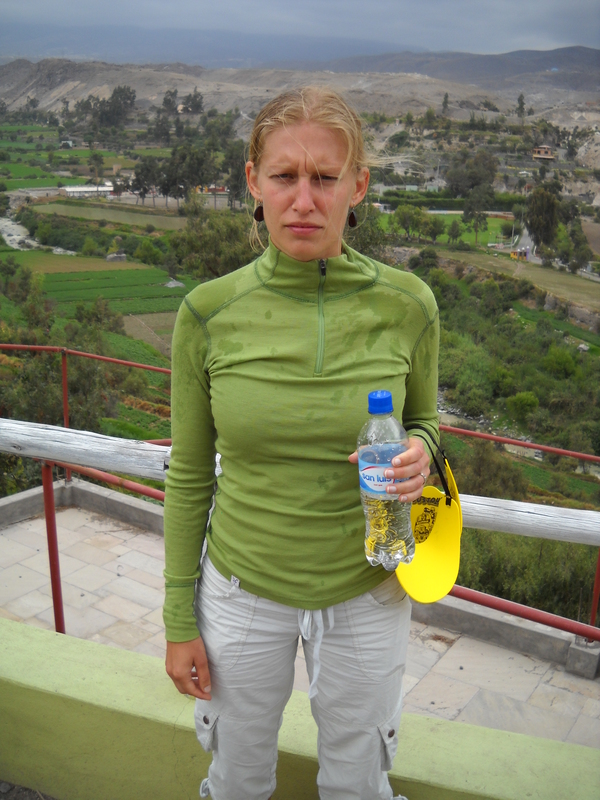 10) We took a four-hour bus ride from Arequipa to our hotel in Colca Canyon. It made several stops along the way. A lot of the ladies selling their crafts had baby alpacas with them….a well planned strategy; I was much more likely to buy a sweater from a lady who had a cute baby animal I could pet. 11) A great view of Mt. Misti from our bus ride. 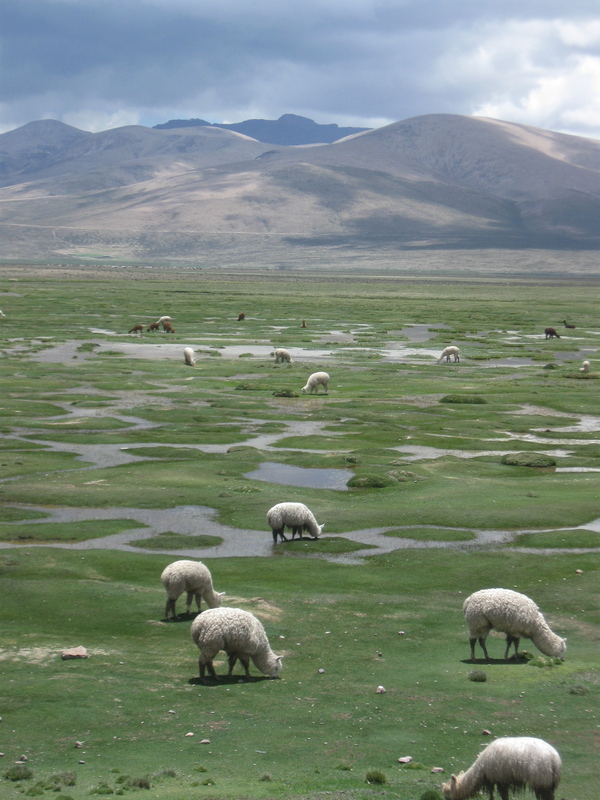 12) Another great view of the mountains with some alpacas grazing in the field. 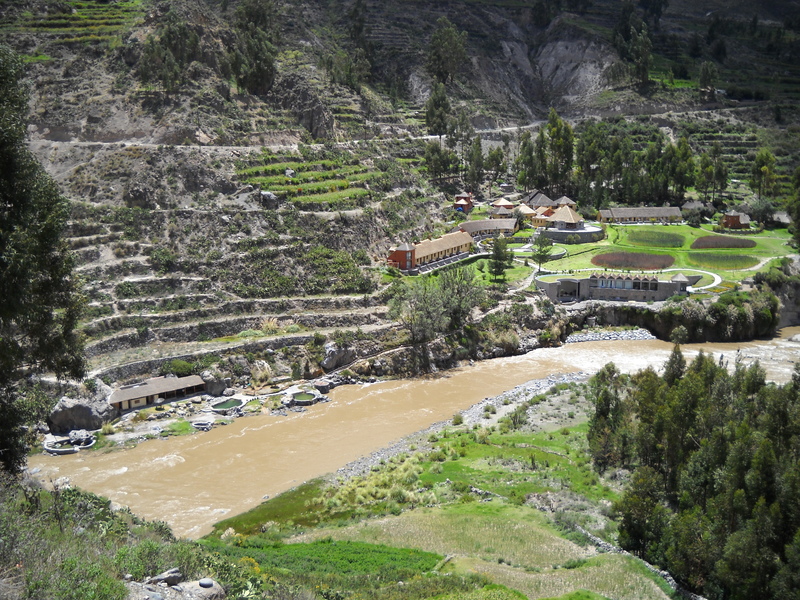 13) View from the road above of the beautiful Colca Lodge and Spa where we stayed in Colca Valley. 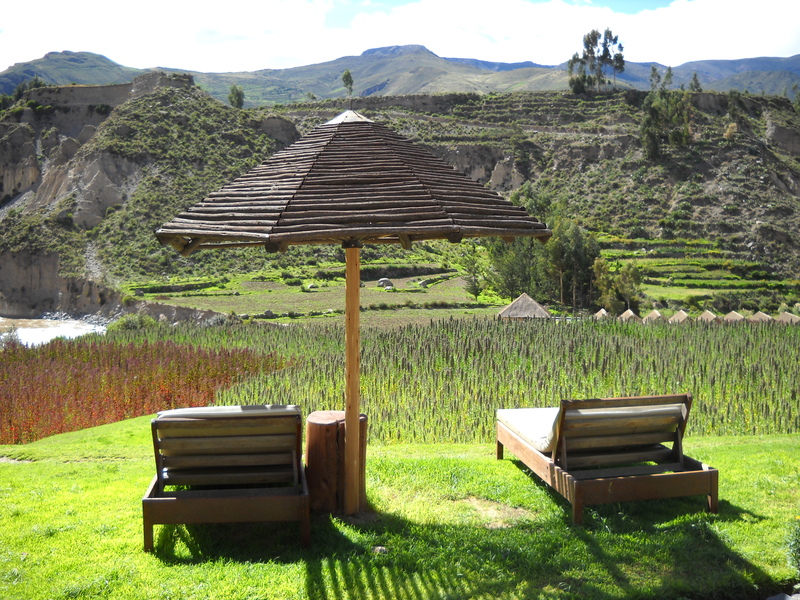 Complete with thermal springs, and an incredibly friendly catering staff, this was a wonderful place to stay. 14) View from our cabin. 15) A bbq style lunch was prepared for us each day with three different types of meats of our choice, served to us at riverside. 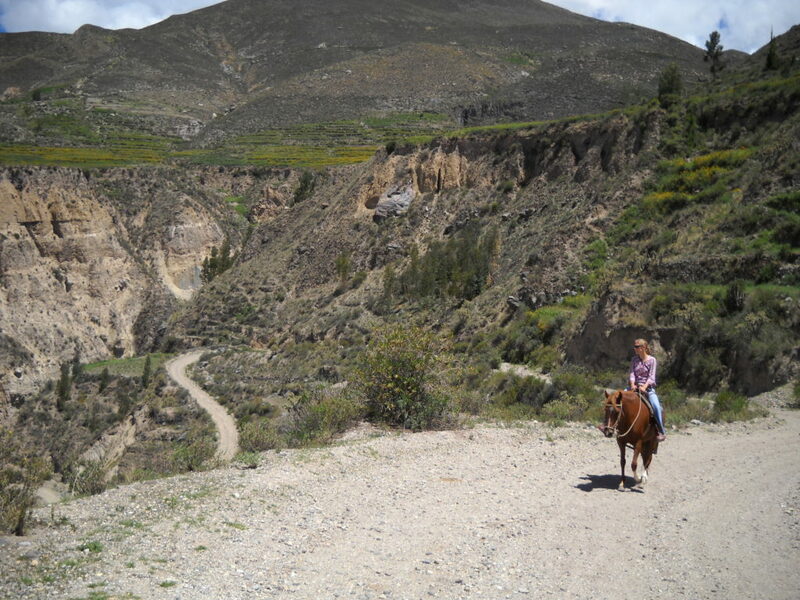 16) We went horseback riding in the canyon on one of our days there. 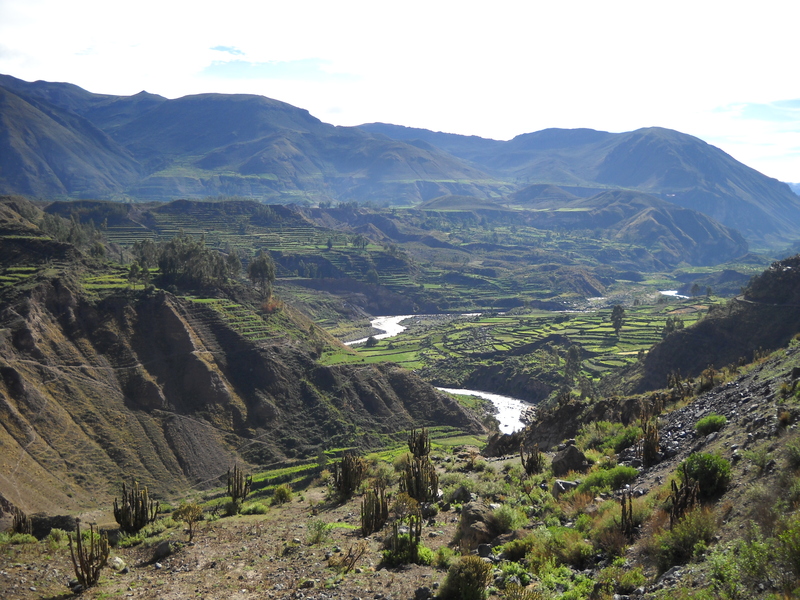 Twice as deep as the grand canyon, Colca Canyon is said to be the largest and tallest canyon in the world. 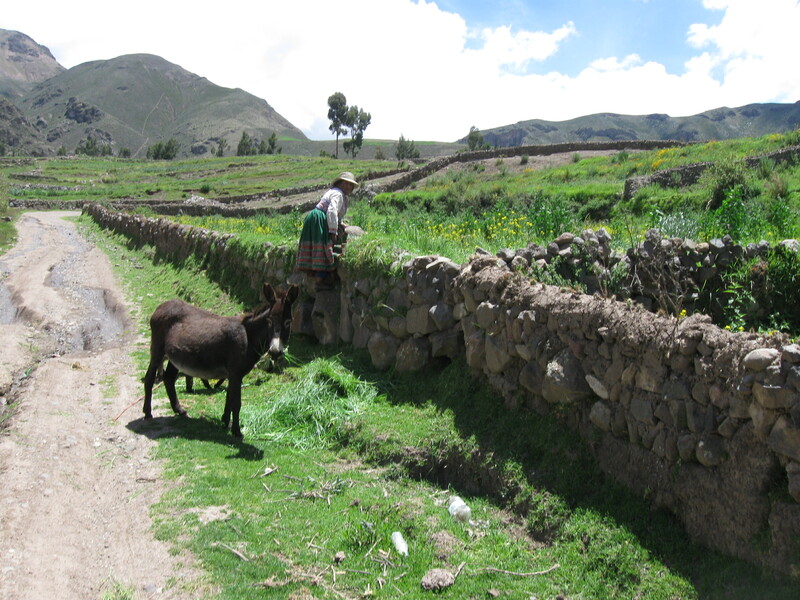 17) A local woman from one of the nearby villages farming with her mule. 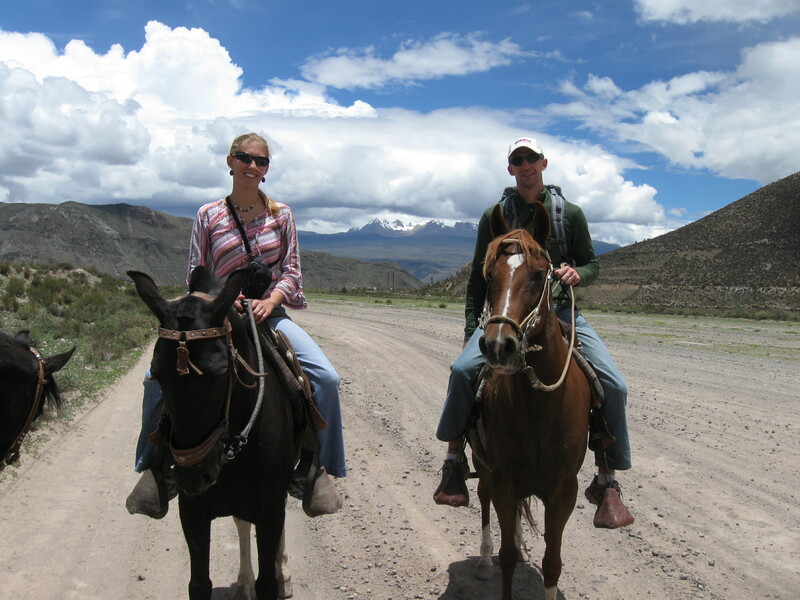 18) The happy couple and their horses. 19) Another view of the canyon. 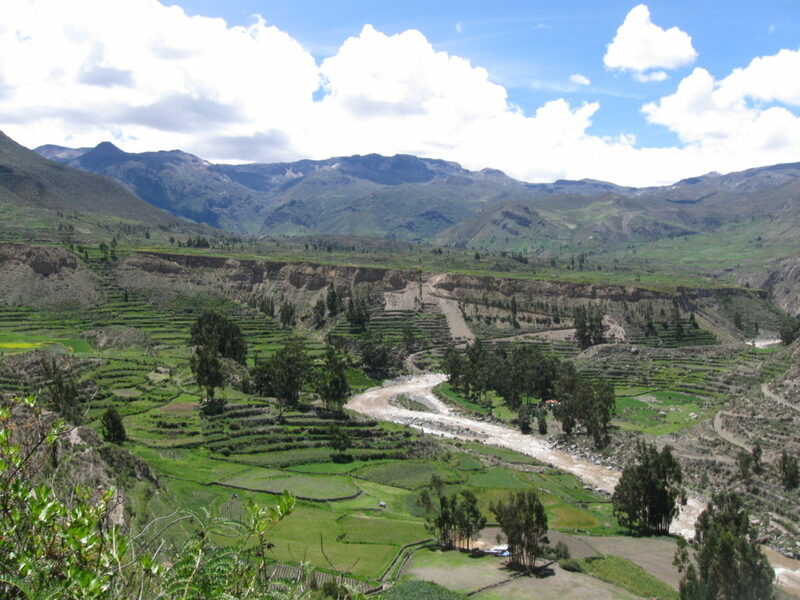 20) Part of the Colca Valley. This does a nice job of showing the terraced gardens they use here. 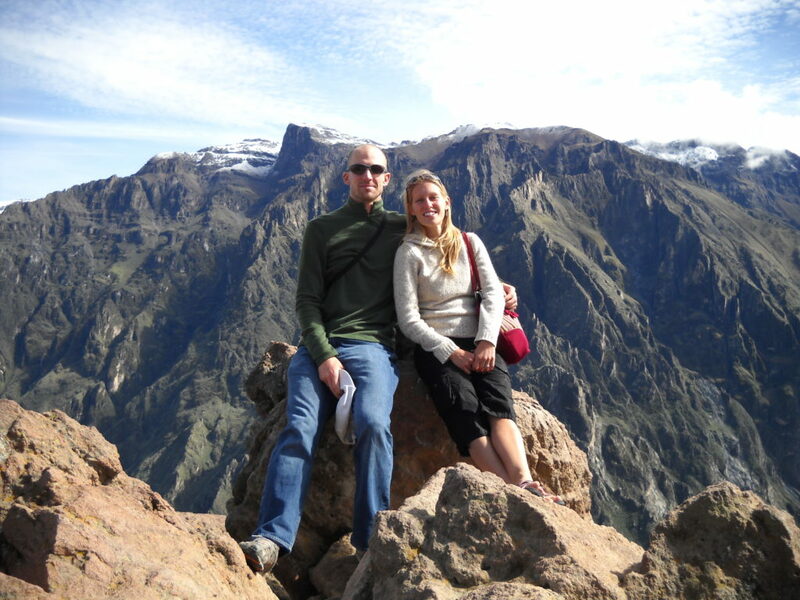 21) The happy couple at the condor overlook. The condors fly very close to the walls of the canyon so it’s a very popular spot for tourists to come and look. We didn’t get any great pics of the condors, but did see a lot of nice views of the canyon! These photos are amazing. What a fantastic experience! 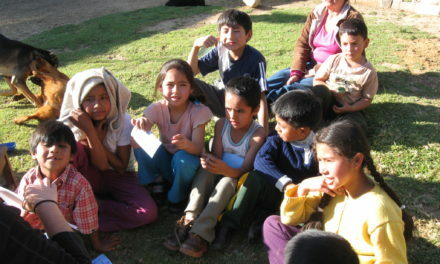 I love learning about Peru through your blogs. Picture #21 made me feel dizzy. I saw a river in your pictures. Were there any trout in it? How about pickerel fish? p.s. Keep writing. It is one of your many gifts. Yes. In fact we did eat trout from the river. No pickels though. Hey Danielle, loved looking through your photographs. 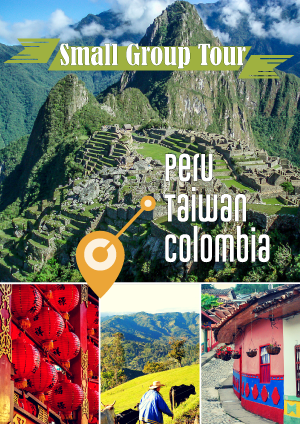 Hope you’re nearly through your ‘frustration’ phase : ) When is the best time to visit Peru!? Getting there. Anytime is a good time to visit. Depends what you want to do! We are talking about trying to plan some type of week long rafting trip …maybe like next year or something…and trying to see if we can throw together a raft full of people. Vamos a ver. You are welcome anytime and I will be happy to host….as are all readers of this blog. I can’t wait to have our first guests. Those pictures are WONDERFUL! You should sell them to the local chamber of commerce for their advertising. Hey, great pics! I hope we can get down there to visit this summer. Charlie looks very comfortable at the nun’s cooking station. Did he miss his calling? Gorgeous pictures! I can’t wait to visit! 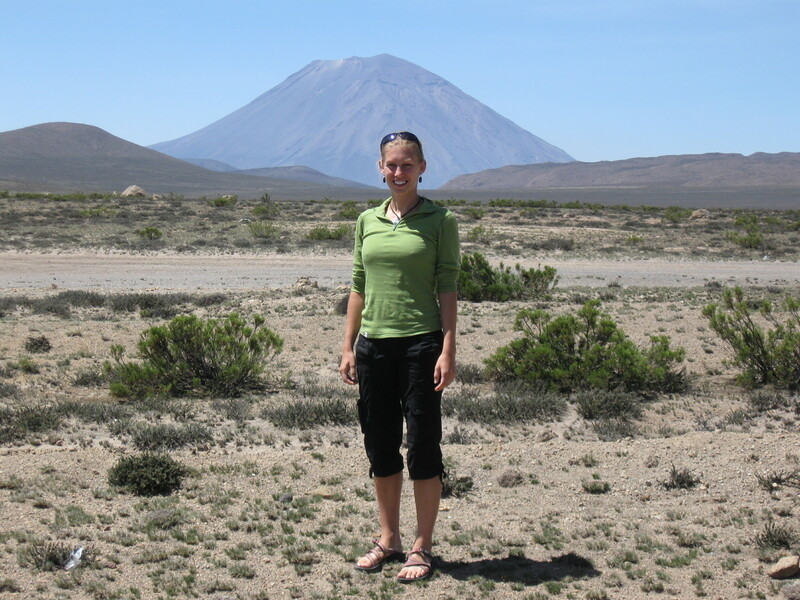 I love Peru, i was there a couple of years back and plan on revisiting machu picchu, cusco, arequipa, colca valley, the nazca lines etc. etc. once isnt enough i suppose..if anyone is interested i’m using http://www.perumagicaltravel.com to plan out the entire vacation, really good prices..